Hey all, it’s hwiseph again, back with a little something different. Recently, I had the chance to see a new commerical that had been released in May of this year. It featured Pocky, a chocolate snack originating in Japan. I know, it’s not as exciting as I thought, but what caught my eye was the appearance of a friend who we all know – Hatsune Miku! This commercial was a rather enjoyable one. The tone was vibrant and Miku also had a little style change, based on the different art style and ribbons twirling around her signature pigtails. 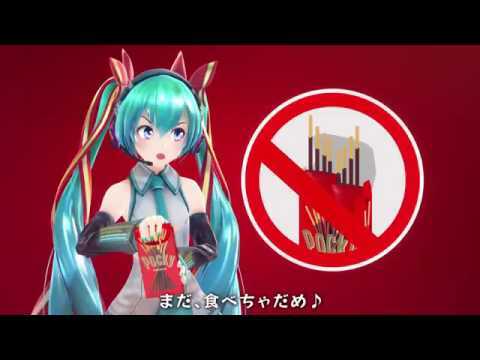 Perhaps it’s the fact that I see Americans near a Vocaloid, but I can’t help but cringe at certain parts of these commercials. The only one that wasn’t as cringy to me was the one where the artist’s edits on Miku translated to her in real life. I can understand where Toyota wanted to head with this idea of implementing Miku as a spokesperson for the car company (I even enjoyed the snippets of supercell in the ads), but it’s all surreal to me. Maybe I’m ignorant, but seeing this makes me want to turn my head the other way. It is rather interesting to consider this, because if these commercials took place in Japan I wouldn’t have batted an eye. I guess the context of things really do matter to me. However, even I can’t deny the large step that this must’ve been for Toyota, Crypton Media, and Japan to use one of the most popular idols as a representative of their product. What are your thoughts on other countries introducing their own culture into different aspects of advertising like product and company ads?